For the first time in two decades, Oklahoma will go at least two years without an execution. 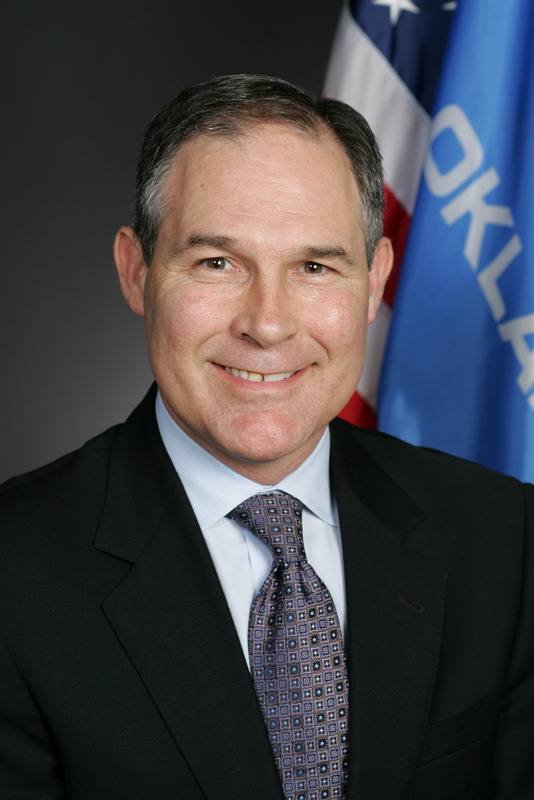 As part of an agreement in a federal lawsuit brought by the state's death row prisoners, Oklahoma Attorney General Scott Pruitt (pictured) has said the state will not request execution dates for at least five months after the state adopts a new execution protocol. Because of this, when the Oklahoma Board of Corrections met on September 13, 2016, the state already could not have sought to conduct any execution until at least February 2017. When the corrections board adjourned without considering any new execution plan, it ensured that even more time would pass between executions in the state. The last time Oklahoma went at least two years without an execution was from March 13, 1992 to March 20, 1995, between the executions of Olan Robison and Thomas Grasso. The current execution hiatus comes in the wake of three consecutive botched execution attempts in Oklahoma. On April 29, 2014, prison personnel could not locate a usable vein in the arm of Clayton Lockett and used a wrong-sized needle in attempting to insert an IV in a vein in Lockett's groin. After 43 minutes, as the botched procedure was being halted, Lockett died of a heart attack. On January 15, 2015, Oklahoma executed Charles Warner in violation of state procedures when the state's anonymous drug provider supplied the wrong execution drug and no one in the execution process noticed the error. In September 2015, the execution of Richard Glossip was halted at the last moment after state officials discovered that they had again obtained the wrong execution drug. A grand jury investigating the state's botched executions issued a scathing report in May 2016 saying administrative "paranoia" over keeping execution information secret "clouded the judgment" of corrections officials, causing them "to blatantly violate their own policies." Following the Corrections Board meeting, Pruitt issued a statement seeking to assure victims' families that process of reviewing a new execution protocol "will continue to be both deliberate and empirical." Pruitt expressed confidence that the new leadership of the state's corrections department—appointed after the retirement of key corrections officials involved in the execution process—"is taking the appropriate time needed to ensure the execution protocols are fully in place and without error in the most efficient way possible." A DOC spokesman described the protocol as "a work in progress," and said "[t]here currently is no timeline on when anything will be released." Glossip—whose case raises significant questions of innocence that have drawn worldwide attention—and four other Oklahoma death row inmates have exhausted their appeals and face execution dates once the state adopts an execution protocol. Rep. Mike Christian, a former highway patrolman who sponsored both the state law to authorize the use of lethal gas as a backup execution method and a November ballot initiative that would remove authority from Oklahoma's state courts to declare its death penalty practices unconstitutional, expressed disappointment in the length of time prison officials have taken to develop a new protocol. Christian said he "think[s] lethal injection is on its way out the door" and questioned why corrections officials didn't "at least have some kind of protocols established for nitrogen hypoxia." Ryan Kiesel, executive director of the American Civil Liberties Union of Oklahoma, said "The last thing the state of Oklahoma needs to do is rush back into the business of executing people. We would prefer that the state get out of the business of executing its citizens altogether," he said. (S. Murphy, "Oklahoma Still Mulling Execution Protocols, Ensuring Delays," Associated Press, September 13, 2016.) See Lethal Injection.